SENTI8 IS A REVOLUTIONARY PRODUCT THAT GIVES SPACE TRAVELERS SCINTILLATING REMINDERS OF HOME AND EARTH DWELLERS OLFACTORY MEMORIES OF SPACE. We have included the hacked vaporizer to disperse the scent. Here is a demo of the Mobile App Senti8 Controller. SCENTI8 is the winner of the 2014 NYC NASA Space Apps Challenge! Eight people came from three states to NYC to create Senti8 at the 2014 Space Apps Challenge. We designed, we hacked, we won! Want to know how Senti8 came together? You can see the Iterative Process Tumbler for Senti8. The code for the project is on Github. Scenti8 was created using Arduino code and a Flora board from Adafruit. 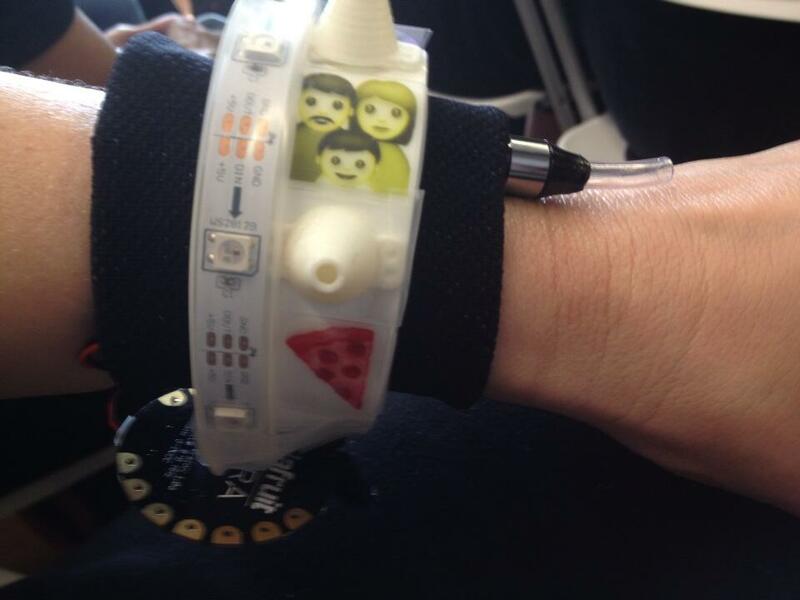 We also used 3D printing to create the scent distributors that attached to the bracelet. 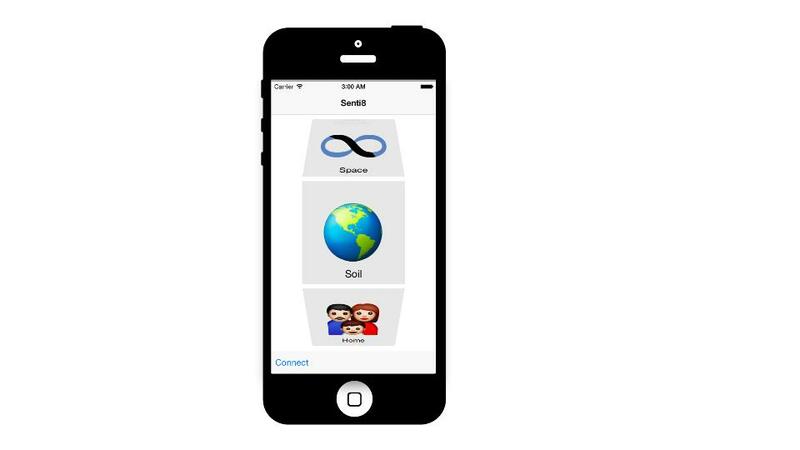 For remote connectivity, the Senti8 mobile app was coded in Objective C for iPhone and it triggers the LED indicator light pattern when a user selects a particular scent. We hacked a small (e-cig) vaporizer to distribute the fragrance. When asked what he missed the most while in space, astronaut Doug Wheelock said, "Believe it or not, just the smell of earth... you know soil". Research has shown that space travelers, as well as others traveling at high altitudes, actually experience diminished senses. The environment of a ship is also very musty and sterile, leaving travelers with a yearning for the smells they miss, which are also linked to happy memories. Our Senti8 personal scent band allows for that experience. The band is surrounded with icons of scent categories, allowing someone to relive their favorite smells, such as "Evergreen Candle" or"Pizza". 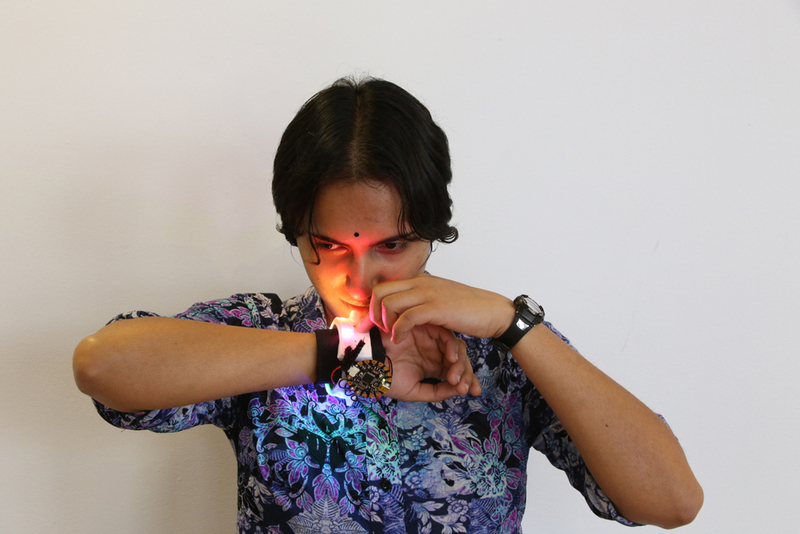 LED lights act as indicators for the chosen scent, and a quick steam propelled burst is delivered directly in the nose, through specially designed cones which encircle the band. Cartridges are replaceable and can be changed out to suit new missed scents. A special connectivity feature allows loved ones and friends to share a favorite scent together, regardless of location. It's a way of being in the same moment together, or more importantly, letting someone know that you miss them. Considerable research has been done for our product. We examined issues of gravity with the design of the cone inhaler feature, to insure proper dispersion. We also made sure to include a glycerin base in our scents to add moisture, as ships have low humidity. As astronauts and other travelers are often burdened with devices or luggage, we made the band easy to operate with one hand. In fact, it meets Section 508 Compliance, as one does not need to see to operate the device. 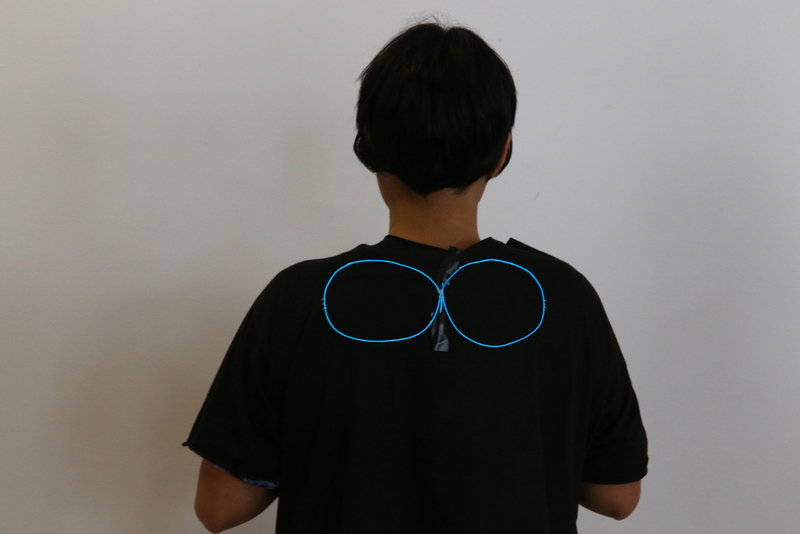 The buttons are raised and easily discernible through touch. We've also taken into account that the product is marketable in many ways. Astronauts may miss earth, earth dwellers may be curious about smells in space, and people on planes may just want a pleasant distraction. Customization is important, and we've happily taken that into account. Our Scent Mall allows the purchase of new smells, including those suggested by our customers. We are anticipating partners of essential oils and other natural fragrances for production and sales. The sophisticated system suggested on our site includes tagging, so one can "Google a favorite smell". We are anticipating significant growth in this area, from earthies to ET's. There is research that shows that smells affect circadian rhythms and emotions. How might these devices help travelers in confined spaces, or help settle young children with ADHD? We are looking forward to the research and are even considering sensors which may be able to identify elements and one day create on-demand mixing of scents. It's our pleasure to provide a product and service that has such a positive impact on the human spirit. That's why we say, #scentimental.